The California State University is the largest system of higher education in the country, with 23 campuses, 50,000 faculty and staff, and 484,000 students. The CSU educates the most ethnically, economically and academically diverse student body in the nation. And, while tuition at the CSU has tripled over the past 20 years, according to the Public Policy Institute of California, it is still more than half of what it costs to attend a University of California campus. So why, then, do roughly four out of every 10 of our students struggle to get enough healthy food to eat? In 2018, a CSU Study of Student Basic Needs was released that showed that 41.6% of CSU students had reported food insecurity, which is defined by the U.S. Department of Agriculture as a lack of consistent access to enough food for an active, healthy life. Of those, 20% reported low food insecurity and 21.6% reported very low food insecurity. In households that are low on income, food budgets are often the first thing to get sacrificed. College students with limited resources often skip meals to make ends meet. 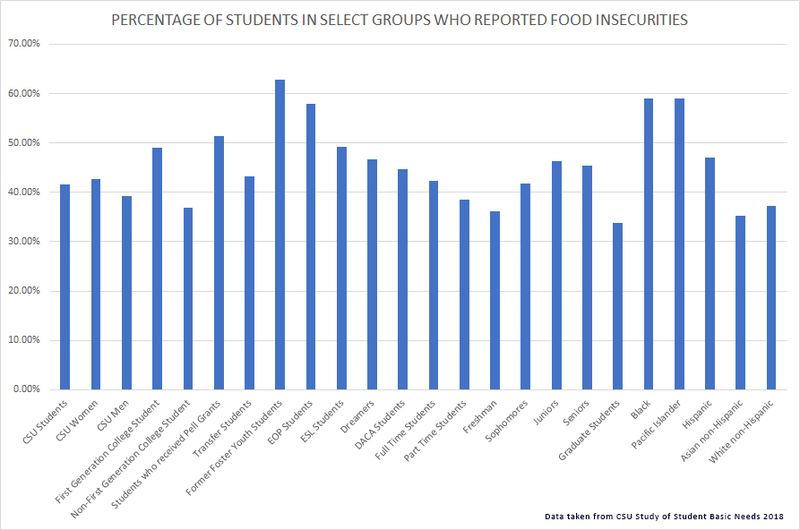 The issue is more severe for first-generation college students, as The Study of Student Basic Needs found that first-generation college students reported higher food insecurity (49.0%) then non-first-generation students (36.9%). Skipping a meal sometimes is not necessarily because a student does not have money, but they are saving the money for an emergency or something else. Often it is not that they cannot afford food, but they cannot afford high-quality foods. Most of us know that good, healthy foods usually costs more and the foods that are bad for us, full of sugar or sodium, are the cheapest foods. Students often try to stretch the foods they have, meaning if they have decent food, they are not eating enough. The Study of Student Basic Needs quoted a student who told of having half a banana in the morning and the other half for dinner, often not being able to concentrate in school due to being hungry or worrying about where her next meal would come from. In 2016, the CSU launched the Basic Needs Initiative to identify and implement solutions to support students’ basic needs, including food insecurity and homelessness. The basic needs study reported that 51.9 percent did not know of on-campus support services. Since then, all 23 CSU campuses have started a food pantry or food distribution program, some have meal sharing or meal voucher programs, and most campuses make fresh fruit and vegetables available to students. At CSUDH, we have the Toro Food Pantry, which provides supplemental food and other necessities to students in need. Its two locations, in the Loker Student Union and at the Women’s Resource Center, allow currently enrolled students to pick up food and other items quickly, easily and confidentially. Stocked from donations by mostly students and faculty, the pantries are open from 8 a.m. to 5 p.m. The pantry is open to any undergraduate or graduate student, and, depending on the flow of donations, offers canned foods and basic hygiene products like deodorant, shampoo, and female hygiene products. There is no limit to how many times a student can utilize the pantry, but they ask that clients only take those items they will use. Along with the food pantry, all CSU campuses also offer CalFresh application assistance to students. CalFresh is California’s Supplemental Nutrition Assistance Program (SNAP) which was established to help low-income individuals and families buy healthy, sustainable foods. Anna Liza Garcia, assistant dean of students, Office of Student Life says, “I am glad more students are using the Toro Pantry, but I want to encourage the students to apply for CalFresh, so they can get healthier, more sustainable foods,” Anna Liza Garcia, assistant dean of students in the Office of Student Life, said. Garcia also emphasized that a useful benefit of CalFresh is that students can continue to use the program after graduating and it can be used at grocery stores, markets, and farmers markets as well. For more information on CalFresh, see the accompanying story on the front page.